Technology is forever changing the landscape of children’s education in and out of school. But much of what masquerades for “educational” in the digital world, is not. In this chapter, we discuss evidence-based principles that can help parents, researchers, and teachers discover apps with real educational value. With the science of learning as a base, we ask whether apps promote children’s active (minds-on) and engaged (not distracted) learning with material that is meaningful and supported in socially interactive contexts. Apps that are built on these principles promote playful, scaffolded, and exploratory learning. This work benefited greatly from conversations and collaborations with James H. Gray, Michael B. Robb, and Jordy Kaufman. Apple. (2016). Learning with iPad [website]. Retrieved from http://www.apple.com/education/products/#learning-with-ipad. Benassi, V., Overson, C. E., & Hakala, C. (Eds.). (2014). Applying science of learning in education: Infusing psychological science into the curriculum. Retrieved from http://teachpsych.org/ebooks/asle2014/index.php. City of New York, Office of the Mayor. (2014). Mayor de Blasio details tech investments in city schools to close achievement gap and better prepare all students for the workforce [press release]. Retrieved from http://www1.nyc.gov/office-of-the-mayor/news/241-14/mayor-de-blasio-details-tech-investments-city-schools-close-achievement-gap-better#/0. Common Sense Media. (2013). Zero to eight: Children’s media use in America, a common sense media research study. Retrieved from https://www.commonsensemedia.org/research/zero-to-eight-childrens-media-use-in-america-2013. Corporation for Public Broadcasting. (2011). Findings from ready to learn 2005–2010. Washington, DC: Corporation for Public Broadcasting. Retrieved from http://www.cpb.org/rtl/FindingsFromReadyToLearn2005-2010.pdf. Dillon, S. (2009, April 29). ‘No Child’ law is not closing a racial gap. The New York Times. Retrieved from http://www.nytimes.com/2009/04/29/education/29scores.html. Guernsey, L. (2014). New America: Education Policy Program. Envisioning a digital age architecture [Policy brief]. Retrieved from http://newamerica.net/publications/policy/envisioning_a_digital_age_architecture_for_early_education. Mayer, R. E. (2014). Research-based principles for designing multimedia instruction. In V. A. Benassi, C. E. Overson & C. M. Hakala (Eds. ), Applying science of learning in education: Infusing psychological science into the curriculum. 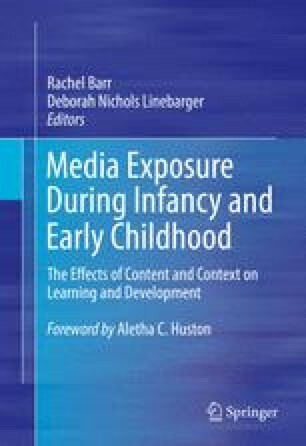 Retrieved from the Society for the Teaching of Psychology website: http://teachpsych.org/ebooks/asle2014/index.php. Organisation for Economic Co-operation and Development. (2012). Programme for International Student Assessment (PISA) Results from 2012: United States. Retrieved from http://www.oecd.org/pisa/keyfindings/PISA-2012-results-US.pdf. Roediger, H. L. (2014, July 18). How tests make us smarter. The New York Times. Retrieved from www.nytimes.com/2014/07/20/opinion/sunday/how-tests-make-us-smarter.html. Walls, C., & Steptoe, S. (2006, December 10). How to bring our schools out of the 20th century. Time Magazine. Retrieved from http://content.time.com/time/magazine/article/0,9171,1568480,00.html. Weisberg, D. S., Hirsh-Pasek, K., & Golinkoff, R. M. (2013). Embracing complexity: Rethinking the relation between play and learning: Comment on Lillard et al. (2013). Psychological Bulletin, 139, 35–39. doi: 10.1037/a0030077.